We describe the prototypical method for producing microscope coverslips coated with fluorescent gelatin for visualizing invadopodia-mediated matrix degradation. Computational techniques using available software are presented for quantifying the resultant levels of matrix proteolysis by single cells within a mixed population and for multicellular groups encompassing entire microscopic fields. Martin, K. H., Hayes, K. E., Walk, E. L., Ammer, A. G., Markwell, S. M., Weed, S. A. Quantitative Measurement of Invadopodia-mediated Extracellular Matrix Proteolysis in Single and Multicellular Contexts . J. Vis. Exp. (66), e4119, doi:10.3791/4119 (2012). Cellular invasion into local tissues is a process important in development and homeostasis. Malregulated invasion and subsequent cell movement is characteristic of multiple pathological processes, including inflammation, cardiovascular disease and tumor cell metastasis1. Focalized proteolytic degradation of extracellular matrix (ECM) components in the epithelial or endothelial basement membrane is a critical step in initiating cellular invasion. In tumor cells, extensive in vitro analysis has determined that ECM degradation is accomplished by ventral actin-rich membrane protrusive structures termed invadopodia2,3. Invadopodia form in close apposition to the ECM, where they moderate ECM breakdown through the action of matrix metalloproteinases (MMPs). The ability of tumor cells to form invadopodia directly correlates with the ability to invade into local stroma and associated vascular components3. Visualization of invadopodia-mediated ECM degradation of cells by fluorescent microscopy using dye-labeled matrix proteins coated onto glass coverslips has emerged as the most prevalent technique for evaluating the degree of matrix proteolysis and cellular invasive potential4,5. Here we describe a version of the standard method for generating fluorescently-labeled glass coverslips utilizing a commercially available Oregon Green-488 gelatin conjugate. This method is easily scaled to rapidly produce large numbers of coated coverslips. We show some of the common microscopic artifacts that are often encountered during this procedure and how these can be avoided. Finally, we describe standardized methods using readily available computer software to allow quantification of labeled gelatin matrix degradation mediated by individual cells and by entire cellular populations. The described procedures provide the ability to accurately and reproducibly monitor invadopodia activity, and can also serve as a platform for evaluating the efficacy of modulating protein expression or testing of anti-invasive compounds on extracellular matrix degradation in single and multicellular settings. Prepare an unlabeled 5% (w/w) stock gelatin/sucrose solution by adding 1.25 g gelatin and 1.25 g sucrose in PBS to a final volume of 50 ml. Warm the stock gelatin solution to 37 °C and ensure it is entirely melted before use. Store the final mixture at 4 °C. Clean 13 mm diameter #1 glass coverslips by placing an individual coverslip into each well of a 24 well plastic tissue culture plate. Add 500 μl of 20% nitric acid to each well and incubate for 30 min. Aspirate the nitric acid solution and wash coverslips three times with deionized water. Coat coverslips with 500 μl of 50 μg/ml poly-L-lysine (prepared from 0.1% stock solution and diluted in deionized water) to each well for 20 min at room temperature. Aspirate the solution and wash three times with PBS. Poly-L-lysine coating facilitates even coating and bonding of the overlying labeled gelatin. Add 500 μl of 0.5% glutaraldehyde (made fresh before use) to each well and incubate the 24 well plates on ice for 15 min. Aspirate and wash three times with cold PBS. Be sure to remove all traces of PBS prior to gelatin coating. Keep plates on ice during all washes until gelatin is added. Reconstitute the Oregon Green 488-conjugated gelatin as per manufacturer's protocol and warm it and the unlabeled 5% gelatin/sucrose solution from (1.1) to 37 °C. Dilute one part Oregon Green 488 gelatin into eight parts of unlabeled gelatin/sucrose (i.e. ; 500 μl of Oregon Green 488 gelatin into 4 ml of 5% gelatin mixture). Pipet 100 μl of the diluted 488-gelatin mixture (kept at 37 °C) onto each coverslip, using enough gelatin to coat the coverslip without manual spreading (which can lead to uneven coverslip coating as shown in Figure 3B). It is important to keep the diluted 488-gelatin mixture at 37 °C during the coating procedure to prevent premature solidification. From this step forward the coverslips should be kept in the dark as much as possible to avoid potential photobleaching. Other ECM proteins conjugated to different fluorophores can be substituted for Oregon Green 488 gelatin (see Discussion). Once all coverslips are coated in a single plate, hold the 24 well plate at an angle and remove excess gelatin from each well by vacuum aspiration. Incubate coated coverslips in the dark for 10 min at room temperature. Wash the coverslips three times with PBS, then add 500 μl of freshly made 5 mg/ml sodium borohydride (NaBH4) for 15 min at room temperature to reduce and inactivate residual glutaraldehyde. Sodium borohydride is effervescent, and small bubbles will be evident on and around each coverslip. Remove the NaBH4 solution by vacuum aspiration with a quick sweeping motion around the outside of each well. Take care not to pick up any floating coverslips that became detached from the bottom of the tissue culture plate during NaBH4 treatment. Detached coverslips that float to the top may be gently pushed back down to the well bottom, but care must be taken to avoid damaging the protein coating. Wash each well three times with PBS and then incubate coverslips in 70% ethanol for 30 min at room temperature. Using sterile technique, transfer the coverslip-containing plates to a type IIA/B cell culture laminar flow hood and rinse coverslips three times with sterile PBS. At this point coverslips can be stored in PBS protected from light at 4 °C for at least two months. Transfer coverslips to be used for degradation assays to an empty well of a new 24 well plate by careful removal using a sterile needle and forceps. Equilibrate coverslips for 1-24 hr with complete media appropriate to the specific cell type being assayed. Care must be taken not to invert the coverslip or scratch the gelatin coating (see Figure 3B). Seed 3-5x104 cells onto a coverslip within each well of the 24 well plate. Conduct a time course study to determine optimal times required for invadopodia degradation activity for the particular cell line/type of interest. Most invasive cells require a time between 4-24 h for degradation to become apparent, although this range can vary widely and should be empirically determined. To synchronize invadopodia activity, cells can be treated with MMP inhibitors (e.g., GM 6001) for a desired time period, then wash out the inhibitor to allow invadopodia activity to proceed (for example, see6). Rinse coverslips three times with PBS, then fix cells with 500 μl of 10% buffered formalin phosphate for 15 min. Rinse three times with PBS and permeabilize for 4 min with 0.4% Triton X-100 in PBS. Rinse three times with PBS to remove the Triton X-100. Label cells using any standard protocol for immunofluorescence staining (see 7 for example) by co-labeling cells with fluorescent conjugated phalloidin to visualize actin filaments (F-actin) and for a known marker protein that localizes to invadopodia (e.g; cortactin5, TKS58, or N-WASp9).Remember to avoid using 488-labeled secondary antibodies or GFP-labeled proteins if using Oregon Green 488 or FITC-labeled gelatin to prevent signal interference. Mount stained coverslips onto glass microscope slides by carefully inverting the coverslip and placing it on a drop of ProLong Gold antifade or similar reagent. To assess matrix degradation, image cells in appropriate channels using a conventional fluorescent or confocal microscope. Gelatin degradation is visualized as darker areas on the coverslip due to proteolytic removal of the fluorescent gelatin (Figure 4A). Labeling of cells for actin and an invadopodia marker protein allows for confirmation of invadopodia at sites of matrix degradation in merged images (Figure 4A). Degradation activity can also be monitored in real time by live cell imaging with fluorescent-tagged recombinant proteins to track invadopodia formation and matrix degradation5,10,11. This analysis provides the normalized area of matrix degradation relative to the area of the cells or the number of cells. It is useful for analyzing entire microscopic fields of view where multiple cells are present that have been collectively treated with siRNA, growth factors or therapeutic agents. For this analysis, images collected at lower magnification are sufficient to efficiently collect information about populations of cells. Open the images in ImageJ12. ImageJ for microscopy can be downloaded from http://www.macbiophotonics.ca/imagej/. Check the scale information by choosing the menu command "Analyze/Set Scale." This information will import automatically with many file formats, but can be entered manually if required. Proper scaling is necessary to report measurements in microns rather than pixels. Select the appropriate measurements to track by choosing "Analyze/Set Measurements." Check Area and Limit to Threshold. Calculate the area of degradation using the fluorescent gelatin image (Figure 5A). Threshold the image ("Image/Adjust/Threshold") to set the upper and lower pixel intensity values to select the areas of degradation (highlighted in red; Figure 5B). In subsequent images, use the Set button in the Threshold window to set the same threshold for all images as an objective means to select degradation area. In some cases, the coverslip may not be perfectly flat when images are acquired. This causes the intensity of the gelatin to change across the image. If this variation creates problems when thresholding the image, correct for uneven illumination across the gelatin by subtracting the background ("Process/Subtract Background") or by filtering with a bandpass filter ("Process/FFT/Bandpass Filter") or a pseudo flatfield filter ("Process/Filters/Pseudo Flatfield") until the background intensity is uniform. Measure the area of matrix degradation ("Analyze/Analyze Particles"). In the Analyze Particles window, choose a particle size > 0 to remove noise from the selection. Show Outlines to identify regions of interest (ROIs). Check Display Results and Summarize to show measurements. If the drawing has specifically outlined all of the areas of degradation (Figure 5C), copy the Total Area measurement into a spreadsheet. If other objects were selected (such as debris), record only the areas of the relevant ROIs. Calculate the cell area using the phalloidin stained (F-actin) image (Figure 5D). Threshold the image ("Image/Adjust/Threshold") to set the upper and lower pixel intensity values so that the edges of the cells are selected (highlighted in red; Figure 5E). In subsequent images, use the Set button in the Threshold window to set the same threshold for all images as an objective means to select cell area. 10 Measure the area of the cells ("Analyze/Analyze Particles"). In the Analyze Particles window, choose a particle size > 0 to remove noise from the selection. Show Outlines to identify regions for analysis (Figure 5F). Check Display Results and Summarize to show area measurements. Do not check Include Holes if there are spaces between cells in a cluster so the non-selected pixels within the cluster will not be included in the cell area calculation. Choose OK. Copy the Area results for relevant ROIs into a spreadsheet. Calculate the area of gelatin degradation per total area of cells13. An alternative approach would be to report the area of degradation per number of cells from counting nuclei (Figure 5G). This is necessary if manipulations alter the cell area between different compared treatment groups. Automatic counting works best if nuclei are well separated, uniform in intensity and round. Automatically count nuclei ("Plugins/Particle Analysis/Nucleus Counter"). Choose Smallest and Largest Particle Size, a Threshold Method and a Smoothing Method. Check Subtract Background, Watershed Filter, Add Particles to ROI Manager and Show Summary (Figure 5H). If nuclei overlap extensively or have an irregular shape or texture, automatic counting may not produce an accurate count (Figure 5H, arrows on right). In this case, manual counting can be facilitated using the cell counter tool ("Plugins/Particle Analysis/Cell Counter"). This will keep count as cells are marked during a manual count (Figure 5I). Copy the number of cells (nuclei) into a spreadsheet. Calculate the area of gelatin degradation per total number of cells. To evaluate matrix degradation resulting from specific cells in a population apart from other cells within the field (e.g., transfected versus non-transfected cells), the procedure in section 3 can be modified to measure the area of degradation under individual cells. An additional fluorescent channel is needed to mark transfected cells. In this instance, higher magnification images and well-separated cells are easier to quantitate. Check the scale information by choosing the menu command "Analyze/Set Scale." Select the appropriate measurements to track by choosing "Analyze/Set Measurements." Check Area and Limit to Threshold. 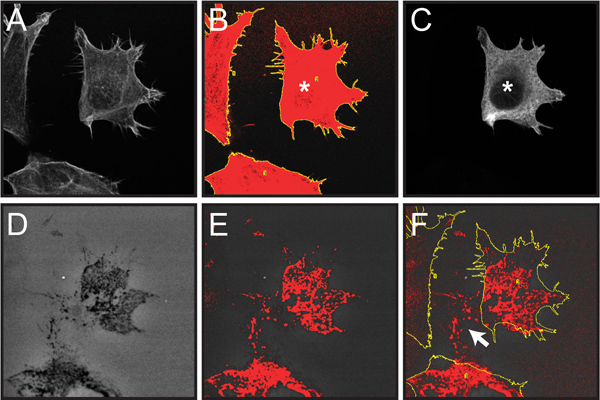 For individual cells that are not touching, identify each cell using the F-actin image (Figure 6A). Threshold the image (see 3.9) (Figure 6B). It is important to capture the edges of the cells, but there can be holes inside that are not included in the threshold. Use the same intensity values across images to select cell boundaries. To measure the area of the cells, use "Analyze/Analyze Particles." In the Analyze Particles window, choose a Size >0 (to eliminate noise), Show Outlines, and check Display Results, Add to Manager and Include Holes (to record the entire area inside the outline). Choose OK and record the Area for each cell from the Results window. Identify which cells are transfected (Figure 6C). Identify the areas of degradation using the fluorescent gelatin image (Figure 6D). If needed, filter the gelatin image to even background intensity (see 3.6). Threshold to select the areas of degradation, making note of the threshold settings (Figure 6E). On subsequent images, use these same upper and lower intensity values (using the Set button in the Threshold window) for an objective selection of areas of degradation. Measure the areas of degradation under the cells. On the thresholded fluorescent gelatin image, show an outline of the cells by selecting ROIs in the ROI Manager window and selecting Measure (Figure 6F). Record the results and calculate the normalized area of degradation/cell or cell area. The overall schematic for the procedure is shown in Figure 1. The procedure entails preparation of glass coverslips and coating with fluorescently-conjugated gelatin, plating of cells onto the coated coverslips to allow cells to degrade the gelatin, fixing and labeling of cells for fluorescence microscopic analysis, imaging the fluorescent matrix to assess the matrix integrity, and objectively quantifying the degree of gelatin matrix degradation using computer software. Figure 1. 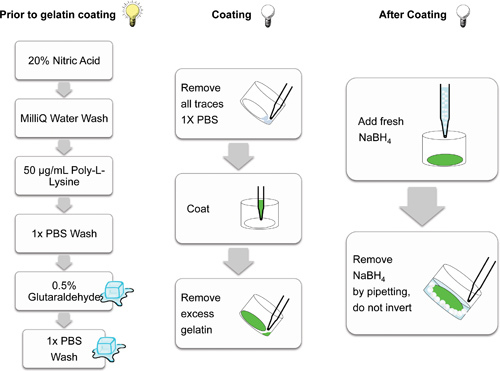 Overall schematic highlighting the key steps involved in fluorescent gelatin coating, cell plating, fixing and immunolabeling, and evaluating matrix proteolysis. The key procedural steps involved in preparing and coating glass coverslips are outlined in Figure 2. Figure 2. Schematic demonstrating the individual steps involved in preparing glass coverslips for gelatin matrix coating. Steps conducted in the light (lit bulb), on ice (cubes) and in the dark (non-illuminated bulb) are cartoon indicated. Steps conducted in the dark help prevent photobleaching of the fluorescent matrices. When properly performed, coverslips are evenly coated with Oregon Green 488-conjugated gelatin, displaying homogenous fluorescence when visualized by microscopy (Figure 3A). Typical artifacts that can arise due to improper coating, handling, storage and usage of coated coverslips are shown in Figure 3B. Figure 3. Examples of artifacts encountered during gelatin coated coverslip preparation and handling. A. Orthogonal view of a confocal z-stack showing the typical color and consistency of an Oregon Green 488-conjugated gelatin coated coverslip produced using the prescribed protocol. 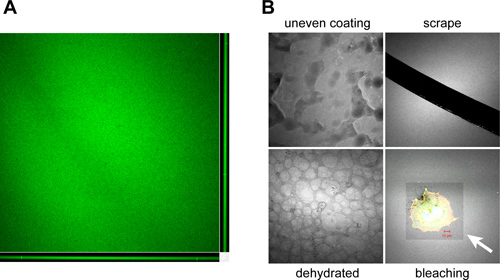 Coverslips should have a homogenous coating ~1-2 μm thick as shown in the X-Z (bottom) and Y-Z (right) confocal planes. B. Artifacts that can occur during the coating and processing of gelatin-coated coverslips include: Improper covering of the coverslip during the coating process due to poor mixing, manual spreading or partial solidification of the gelatin mixture (uneven coating), removal of the coated matrix by scoring with needles or forceps during handling (scrape), drying of the coverslip surface during prolonged storage periods, resulting in a "cobblestone" appearance (dehydrated) and photobleaching of the fluorescent gelatin surface during imaging due to prolonged or high intensity light exposure (bleaching). White arrow indicates bleached area encompassing a plated OSC19 head and neck squamous carcinoma cell. The Oregon Green 488-conjugated gelatin is pseudocolored white to enhance image contrast. Bar, 10 μm. The resulting thin matrices produced during this procedure provide a sensitive means to evaluate the ability of cells to degrade ECM. Figure 4 demonstrates an example of invadopodia activity from an OSC19 cell plated on an Oregon Green-488 conjugated gelatin coverslip and imaged by conventional confocal microscopy as well as by volume-fill image rendering following three dimensional deconvolution. Figure 4. Representative examples of invadopodia matrix degradation activity. A. Visualization of invadopodia and corresponding gelatin matrix proteolysis. OSC19 cells plated on Oregon Green 488-conjugated gelatin coverslips for 10 hr were fixed and labeled with rhodamine-conjugated phalloidin (F-actin) and anti-cortactin antibodies (visualized with an Alexa Fluor 647 secondary antibody and pseudocolored green). Invadopodia are evident as focal cytoplasmic concentrations of F-actin and cortactin that overlap with areas of gelatin clearing (dark holes in the matrix) within the merged image. Boxed regions containing arrowheads indicate individual invadopodia and areas of focal matrix proteolysis as shown in the enlarged regions below. Bar, 10 μm. B. Volume fill visualization of invadopodia penetration into the ECM. OSC19 cells plated and stained as in (A) were visually rendered by obtaining 23 successive 0.32 μm optical z-slices totaling 7.04 μm for rhodamine-conjugated phalloidin and Oregon Green 488-conjugated gelatin. The native LSM file set for each channel was opened in AutoQuant X2.2 software and a 3D blind deconvolution of each image stack was performed using the recommended settings (10 iterations, medium noise). The processed images were saved as TIFF stacks that were then opened in NIS Elements and rendered as a volume view with alpha blending. The LUTs were adjusted, and a subvolume was created to show an edge inside the cell where invadopodia are present. Dorsal-edge view demonstrates invadopodia (red, arrows) inserted into the underlying gelatin (green). Ventral-edge view shows protrusive invadopodia and areas of gelatin degradation underneath the coverslip as regions of red present in the green matrix (arrowheads). The total image field presented is cropped to 77 x 65 μm; the cell is~ 60 x 40 μm. Figure 5 shows some of the important steps for quantification of normalized gelatin matrix degradation as described in step 3 of the protocol. This procedure is designed to allow for unbiased quantitation of gelatin degradation in an entire field of view, and is suitable for matrix degradation attributed to many cells within the field. Figure 5. Screen capture images demonstrating key steps in computational-assisted quantification of normalized gelatin degradation for cells within an entire microscopic image as described in protocol step 3. All fluorescent images have been converted to grayscale to better display the red thresholding and ROI markings. A. Image of Oregon Green 488-conjugated gelatin, showing dark areas ("holes") where degradation has occurred (step 3.4). B. Thresholded gelatin image highlighting areas of degradation in red (step 3.5). C. Drawing showing ROIs measured for area of degradation (step 3.7). D. Rhodamine phalloidin staining of F-actin (step 3.8). E. Thresholded actin image highlighting total cell area in red (step 3.9). F. Drawing showing cell areas to be measured (step 3.10). G. Image of DAPI-stained cell nuclei (step 3.13). H. Red outlines show results from automatic nuclei counting (step 3.13). The Watershed filter has the potential to separate nuclei that are touching (white arrow). If nuclei overlap extensively, they may not be separated into individual objects (red arrow). If a nucleus has an irregular shape, it may be separated into multiple objects (yellow arrow). I. Results from marking nuclei during a manual count using the cell counter tool (step 3.14). Figure 6. demonstrates select steps involved in quantifying fluorescent gelatin degradation by individual cells within a mixed cellular population as described in protocol step 4. Here, matrix degradation by transfected cells can be analyzed within a mixed population of transfected and non-transfected cells. Figure 6. 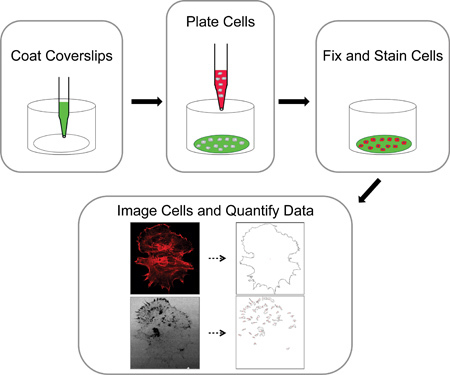 Screen capture images of steps involved in quantifying gelatin degradation from individual transfected cells within a cell population. Quantification of a single transfected OSC19 cell overexpressing recombinant cortactin fused to the FLAG epitope tag is shown as an example. All fluorescent images have been converted to grayscale to better display the red thresholding and yellow ROI markings. A. Confocal image of three cells labeled with rhodamine-phalloidin (step 4.2). B. Drawing of total cell area based on F-actin staining following application of the Threshold and Analyze Particles functions (step 4.2-3). C. Confocal image of anti-FLAG immunolabeling of the cell population demonstrating a single cell expressing FLAG-tagged cortactin (marked with *) (step 4.4). D. Image of Oregon Green 488-conjugated gelatin, showing dark areas ("holes") where degradation has occurred (step 4.5) E. Thresholded gelatin image highlighting dark areas of degradation in red (step 4.5). F. Thresholded gelatin image overlaid with cell outlines from panel B (step 4.6). Note that only the thresholded pixels within the cell outlines are counted in the analysis. Areas of degradation outside the current cell location (white arrow) result from cell migration across the gelatin over time and are not included in the analysis. The ability to visualize cells degrading the extracellular matrix has aided in discovering the molecular mechanisms employed in the early steps of cell invasion. Pioneered by Wen-Tien Chen in the early 1980's4,14,15, coating fluorescently labeled extracellular proteins on glass coverslips for subsequent microscopic analysis has emerged as the primary technique in evaluating invadopodia function across a wide range of cell types. 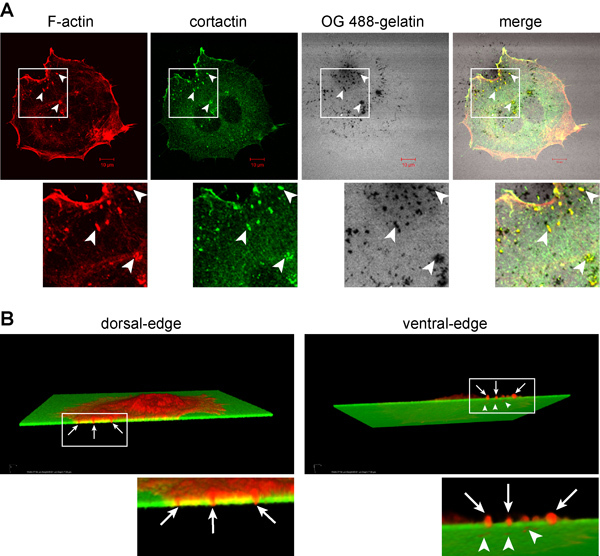 The prescribed protocol demonstrates the basic method used for preparing gelatin-coated coverslips that form a collagenous layer less than 2 μm thick suitable for detection of extracellular matrix degradation by cells in most conventional fluorescent and confocal microscopes11,16-18, similar to what has been previously described19-21. These properties allow for rapid production of coated coverslips capable of detecting the initial onset of matrix degradation. The sensitivity afforded by the resulting thin gelatin matrix on the underlying hard glass surface likely aids in promoting invadopodia formation as a response to the high inherent stiffness of the overall matrix environment22. However, these matrices are not well suited for analysis of invadopodia elongation or additional morphological evaluation that has been achieved using thicker (30-100 μm) gelatin layers with similar methodology, coated transwells or electron microscopy20,23,24. We have found that pre-conjugated commercially produced Oregon Green 488 gelatin allows for rapid experimental set up and consistent, reproducible results. However, alkaline borate conjugation of fluorescein isothiocyanate (FITC) to unlabeled gelatin remains a popular and inexpensive method for producing fluorescent gelatin conjugates20. Fibronectin is also used as an alternative matrix protein for labeling and coverslip coating4,9, and in some cases investigators have used labeled fibronectin layered onto unlabeled gelatin coated coverslips to create denser matrices11,25. Other matrices could be used, depending on the specifics of the cell type. In addition to dyes in the green 488 nm spectrum, a wide range of fluorophores have also been used with manual coupling methods to generate coverslips with different fluorescence spectra, including rhodamine21,26, Alexa Fluor 35024, 54621, 5685,11, 59427 and 6475 dyes. Such conjugates are easily adaptable for use in the prescribed protocol, providing the flexibility for utilizing specific ECM protein-dye combinations suitable for most any imaging filter set. The techniques described herein provide the necessary detailed steps for utilizing ImageJ to quantify gelatin matrix degradation attributed to individual cells in a heterogeneous population or to entire cell groups as published previously6,28. Proprietary software has also been successfully employed for the same purpose5,25. In this protocol, the area of matrix degradation is normalized to either the total area of the cells or the total number of cells (nuclei) in the field. Generally, both options for normalization will give the same result (ELW, data not shown). However, if different cell lines having different sized cells are being compared or if the experimental treatment causes cells to change size, then it may be more accurate to normalize to cell number. On the other hand, many cancer cell lines have a high percentage of multi-nucleated cells, in which case total cell area may be a more accurate parameter for normalization. Also, if only part of a cell is captured in an image (Figure 6), it may be better to normalize to cell area rather than underestimate the degradation potential for an individual cell. It is important to optimize the image analysis to best suit the characteristics and nuances of the specific experimental setup. For determining cell numbers in a crowded field, counting nuclei is often the method of choice. ImageJ has a nucleus counter plugin for automatic counting. One option in this tool is the Watershed filter. This filter will help separate nuclei that are touching by segregating them into individual objects (Figure 5H, white arrow). However, this filter may not be able to separate nuclei that overlap extensively (Figure 5H, red arrow). In addition, if a nucleus has an irregular shape and large variations in intensity, the filter may separate a single nucleus into multiple objects (Figure 5H, yellow arrow). Therefore, it is important to try different thresholding and smoothing methods in this plugin to determine the best parameters for analysis. If the automatic counting does not produce accurate numbers, the cell counter plugin can facilitate manual counting of cells or nuclei. In cases utilizing transient transfection, images will often contain a mixture of cells expressing or not expressing a protein of interest (Figure 6). In this scenario, it is not always apparent which cells were responsible for creating areas of matrix degradation. This is especially true if the cells are migrating across the gelatin. To be consistent in the analysis, it is important to only measure the degraded areas directly underneath each cell. By thresholding to select the dark areas in the matrix and using the actin to generate cell outlines, only the degraded areas under the cells will be quantitated. This procedure will exclude degraded areas outside of cell boundaries from analysis (Figure 6F, arrow). The assay may require optimization to select a time point that allows sufficient time for degradation before the cells have had a chance to move. Numerous methods have been developed to quantitate invadopodia formation and function. In addition to matrix degradation, other frequently reported parameters include determining the number of invadopodia per cell, the percentage of cells displaying invadopodia within a given population, and the number of "immature" or "pre" non-degrading invadopodia compared to "mature" invadopodia capable of degrading the ECM11,13,25,26. The method(s) of choice for invadopodia evaluation depend on inherent characteristics of each cell type. For instance, counting the number of invadopodia per cell or determining the percentage of cells containing invadopodia is a straightforward approach that works well if the analyzed cells contain just a few prominent invadopodia, but becomes more difficult in cells that have dozens of invadopodia or where invadopodia may be small and difficult to detect. Using the degradation assay makes it possible to calculate the percentage of pre-invadopodia vs. mature invadopodia in single cells or in a population by comparing the total number of cells with invadopodia to the percentage that are degrading matrix. If there is a discrepancy where fewer cells are degrading matrix compared to cells displaying invadopodia, it may indicate that these cells are forming pre-invadopodia that were incapable of matrix degradation at the time the cells were fixed. Whatever method combination is chosen for analysis, it is important to quantify the desired invadopodia characteristics as objectively as possible. When collecting images on the microscope, choose fields by looking at cells (actin), rather than the fluorescent matrix, to avoid bias from preferentially selecting areas with high levels of degradation. Multiple images should be acquired to ensure a fair representation of the cell population. Images should also be acquired at an appropriate magnification. 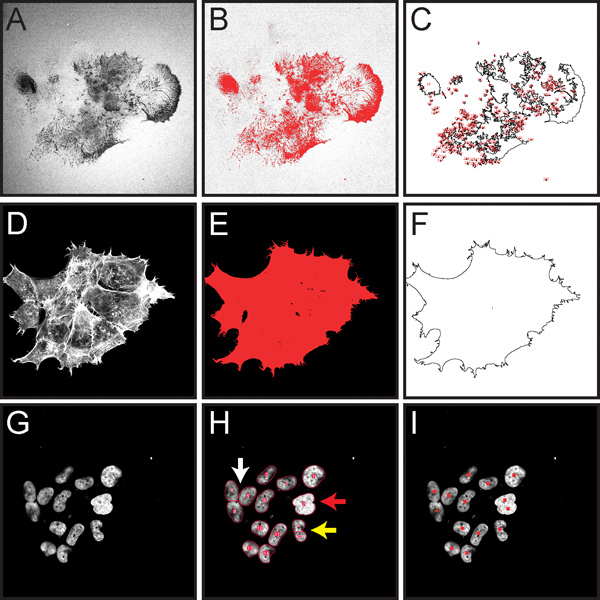 For uniform populations of cells, lower magnification can be used to collect more cells as long as the areas of degradation can still be resolved. Higher magnification images are preferred to measure areas under individual cells and to resolve individual invadopodia. When areas are being quantitated, thresholding images based on intensity is more objective than manually choosing the area of the matrix to measure. In all cases, a sufficient number of cells from multiple independent experiments should be analyzed to give statistically meaningful, reproducible results. This work was supported by endowment funds from the West Virginia University Mary Babb Randolph Cancer Center. We thank Susette Mueller (Georgetown University) and Laura Kelley for early advice and assistance. The use of the West Virginia University Microscopy Imaging Facility (supported by the Mary Babb Randolph Cancer Center and, NIH grants P20 RR16440, P30 RR032138 and P30 GM103488) is gratefully acknowledged. Ridley, A. J. Life at the leading edge. Cell. 145, 1012-1022 (2011). Murphy, D. A., Courtneidge, S. A. The 'ins' and 'outs' of podosomes and invadopodia: characteristics, formation and function. Nat. Rev. Mol. Cell Biol. 12, 413-426 (2011). Linder, S., Wiesner, C., Himmel, M. Degrading Devices: Invadosomes in Proteolytic Cell Invasion. Annu. Rev. Cell. Dev. Biol. (2010). Chen, W. T., Chen, J. M., Parsons, S. J., Parsons, J. T. Local degradation of fibronectin at sites of expression of the transforming gene product pp60src. Nature. 316, 156-158 (1985). Artym, V. V., Zhang, Y., Seillier-Moiseiwitsch, F., Yamada, K. M., Mueller, S. C. Dynamic interactions of cortactin and membrane type 1 matrix metalloproteinase at invadopodia: defining the stages of invadopodia formation and function. Cancer Res. 66, 3034-3043 (2006). Ayala, I., et al. Multiple regulatory inputs converge on cortactin to control invadopodia biogenesis and extracellular matrix degradation. J. Cell Sci. (2008). Ammer, A. G., et al. Saracatinib impairs head and neck squamous cell carcinoma invasion by disrupting invadopodia function. J. Cancer Sci. Ther. 1, 52-61 (2009). Seals, D. F., et al. The adaptor protein Tks5/Fish is required for podosome formation and function, and for the protease-driven invasion of cancer cells. Cancer Cell. 7, 155-165 (2005). Yamaguchi, H., et al. Molecular mechanisms of invadopodium formation: the role of the N-WASP-Arp2/3 complex pathway and cofilin. J. Cell Biol. 168, 441-452 (2005). Kopp, P., et al. The kinesin KIF1C and microtubule plus ends regulate podosome dynamics in macrophages. Mol. Biol. Cell. 17, 2811-2823 (2006). Oser, M., et al. Cortactin regulates cofilin and N-WASp activities to control the stages of invadopodium assembly and maturation. J. Cell. Biol. 186, 571-587 (2009). Abramoff, M. D., Magalhaes, P. J., Ram, S. J. Image Processing with ImageJ. Biophotonics International. 11, (7), 36-42 (2004). Kelley, L. C., et al. Oncogenic Src requires a wild-type counterpart to regulate invadopodia maturation. J. Cell Sci. 123, 3923-3932 (2010). Chen, W. T., Singer, S. J. Fibronectin is not present in the focal adhesions formed between normal cultured fibroblasts and their substrata. Proc. Natl. Acad. Sci. U.S.A. 77, 7318-7322 (1980). Chen, W. T., Olden, K., Bernard, B. A., Chu, F. F. Expression of transformation-associated protease(s) that degrade fibronectin at cell contact sites. J. Cell Biol. 98, 1546-1555 (1984). Bharti, S., et al. Src-dependent phosphorylation of ASAP1 regulates podosomes. Mol. Cell Biol. 27, 8271-8283 (2007). Albrechtsen, R., Stautz, D., Sanjay, A., Kveiborg, M., Wewer, U. M. Extracellular engagement of ADAM12 induces clusters of invadopodia with localized ectodomain shedding activity. Exp. Cell Res. 317, (10), 195-209 (2011). Scott, R. W., et al. kinases are required for invasive path generation by tumor and tumor-associated stromal cells. J. Cell Biol. 191, 169-185 (2010). Mueller, S. C., Yeh, Y., Chen, W. T. Tyrosine phosphorylation of membrane proteins mediates cellular invasion by transformed cells. J. Cell. Biol. 119, 1309-1325 (1992). Bowden, E. T., Coopman, P. J., Mueller, S. C. Invadopodia: unique methods for measurement of extracellular matrix degradation in vitro. Methods Cell Biol. 63, 613-627 (2001). Baldassarre, M., et al. Dynamin participates in focal extracellular matrix degradation by invasive cells. Mol. Biol. Cell. 14, 1074-1084 (2003). Alexander, N. R., et al. Extracellular matrix rigidity promotes invadopodia activity. Curr. Biol. 18, 1295-1299 (2008). Artym, V. V., Yamada, K. M., Mueller, S. C. ECM degradation assays for analyzing local cell invasion. Methods Mol. Biol. 522, 211-219 (2009). Schoumacher, M., Goldman, R. D., Louvard, D., Vignjevic, D. M. Actin, microtubules, and vimentin intermediate filaments cooperate for elongation of invadopodia. J. Cell Biol. 189, 541-556 (2010). Clark, E. S., Whigham, A. S., Yarbrough, W. G., Weaver, A. M. Cortactin is an essential regulator of matrix metalloproteinase secretion and extracellular matrix degradation in invadopodia. Cancer Res. 67, 4227-4235 (2007). Yamaguchi, H., et al. Phosphoinositide 3-kinase signaling pathway mediated by p110alpha regulates invadopodia formation. J. Cell Biol. 193, 1275-1288 (2011). Li, A., et al. The actin-bundling protein fascin stabilizes actin in invadopodia and potentiates protrusive invasion. Curr. Biol. 20, 339-345 (2010). Yamaguchi, H., et al. Phosphatidylinositol 4,5-bisphosphate and PIP5-kinase Ialpha are required for invadopodia formation in human breast cancer cells. Cancer Sci. (2010).